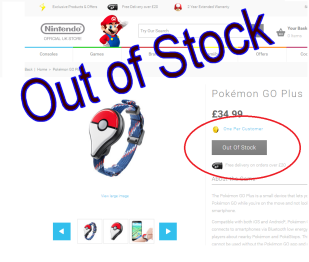 The official Nintendo UK store has now stopped taking pre-orders for the Pokemon GO Plus wearable device. The release on 16th September is now increasingly looking like a sell out. After the initial release delay, Nintendo started taking pre-orders again at on 8th September at 2.10PM and stopped just after 9.30am 13th September, giving buyers only a 5 day window to purchase. As predicted, the number eBay listings have spiked in the last few days with average prices around the £60 mark together with a third party seller on Amazon selling for £79.99. That is a large mark up on the recommended retail price of £34.99, however it gives buyers an option if they would like one quickly. Nintendo maybe holding back a small amount stock for this Friday’s release, however you will need to be on the ball as it's unlikely to last long. We recommend you use our desktop stock checker (with alarm turned on) to alert you when stock next appears.